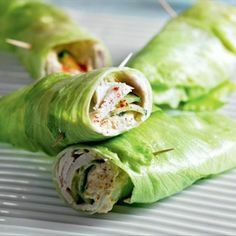 Place sliced turkey with cucumber/carrot, hummus & paprika in a lettuce leaf. Then wrap with another leaf to make a wrap. Repeat with remaining ingredients.